Veterans of Publican Quality Meats have opened a sandwich shop near Grand and Noble featuring their artisanal charcuterie. The place has counter service plus a few tables for dining in. A tasty sandwich, but I couldn't get past the $12.50 price point for about 5 inches of sandwich. Just down the street I can get a little more sandwich for less money: Graziano, Vinnie, Bari, etc. I guess their argument would be that the meats are better quality, but when five or so meats are in the same sandwich, I think quality gets a bit blurred. 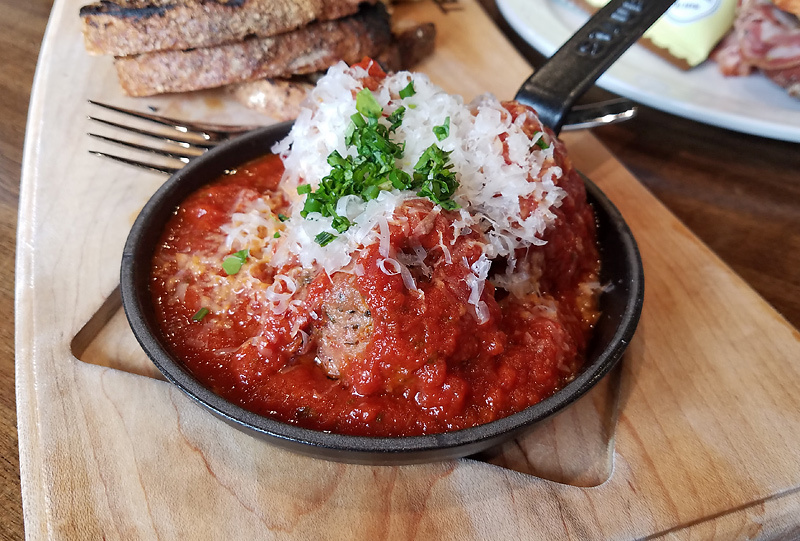 There are some other interesting menu items, such as nduja arancini, plus a variety of artisanal sodas for $2.99 and a few flavors of gelato. There are also charcuterie boards. Last edited by TomInSkokie on January 23rd, 2018, 5:49 am, edited 7 times in total. TomInSkokie wrote: A tasty sandwich, but I couldn't get past the $12.50 price point for about 6 inches of sandwich. Just down the street I can get a little more sandwich for less money: Graziano, Vinnie, Bari, etc. I hear you on this, though I think the price is okay considering the product, it was also plenty enough food for me. A Mr. G at Grazi's runs $10.95 (more bread, less meat). But unlike the ideally-proportioned Mr. G, I agree the flavors on the Dante muddle together. Satisfying, but not quite transcending the Chi-talian sub form. The St. Gennaro, on the other hand, will keep me running back! Definitely not your average neighborhood red-sauced sassage sammich– a coil of juicy tube meat nestled on a billow of aioli and sweet grilled onions, all stacked on a pillowy brioche bun. Kind of an incomparable sammy. I'm super stoked to have this place a few blocks from my work place. When picnic season rolls around, I'll be set with all my charcuterie needs. That nduja, well I hardly need to convince anyone of its merits. If you haven't heard, an embarrassingly massive orb of the stuff greets you on the counter for a little amuse bouche. Very cool place, nice folks too! Count me in as a fan of the Southside Johnny - a porchetta dip with brun-uusto cheese, broccolini, and chimichurri. They are making some very very very high quality sandwiches here. Surprised it took so long for someone to post about this after the Gebert write-up. I have been a fan of PQM since it opened and, while I'm seldom in that neck of the woods anymore, I still make it a point to stop. Tempesta is an entirely Italian-focused version of PQM, in a very good way. No, it isn't cheap, but it's on par with PQM in many ways, and the house charcuterie is truly excellent. We went two days before a trip to the Philippines, about which I will eventually post. It was my spouse's birthday the following day and she loves a good meat-and-cheese plate. Since we were both packing and having family over last-minute, a nice spread to graze on while chatting and sitting on luggage seemed appropriate. We did not order the platters as such, as we wouldn't be consuming them right away. Instead, they wrapped six meats and two cheeses (in roughly 1/4 portions each, as I recall) and, after throwing in some breads, we were out the door for fifty or sixty bucks, as I recall, and this was plenty to feed two of us for dinner and an additional five for heavy snacking. They were very friendly and helpful in figuring out what and how much to get. Truthfully, we had enough leftover for a couple good sandwiches. 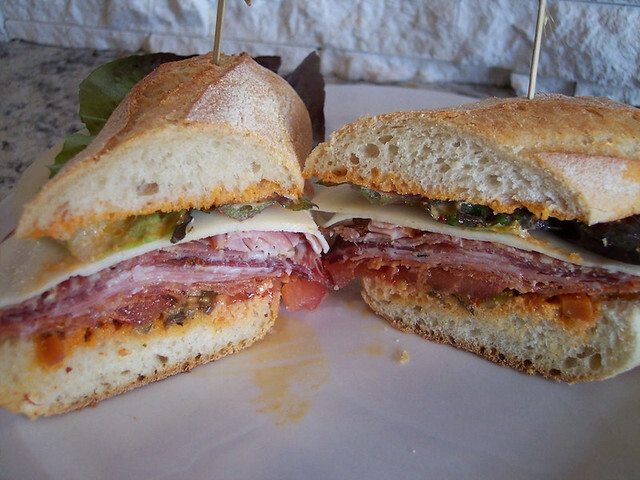 We also had a sandwich, the Dante, which is perfectly captured above. I thought it quite good, and plenty of food, though the bread can easily destroy the roof of your mouth. I was particularly big on the nduja aioli, which was probably overwhelming, but damn, I'd put that on everything. Here's part of the meat case, just for fun. Most things are priced in 1/4 pound increments for easier mental calculation, weight and money. In general, I loved the spread and we will be going back--compared to some of the imports (even at a place like Mariano's), the prices were pretty fair for meats that were obviously high-quality. I seldom enjoy mortadella, for example, but this one actually had flavor. Everyone kept eating, beyond the point of satiety. For a last-minute party before the real deal Filipino Christmas, it was hard to ask for more. Beware of the platters! We bought 3 meats ($15) and 2 cheeses ($12) platters and to call them meager is an incredible compliment. Jefe wrote: The St. Genaro, on the other hand, will keep me running back! Yes, absolutely, though I can't wait to work my way through the menu. Tempesta Market, Count me a Fan! Tempesta was hit and miss for me. Enjoyed the ample Dante, which was a tasty, high-quality meat bomb. Though, the inclusion of lettuce and tomato left me scratching my head. There's no reason to include those ingredients on sandwich like this, especially not tomatoes this time of year. The Southside Johnny was a shamefully skimpy affair. There was a mere condiment-level amount of Porchetta. I had to open up the sandwich and search for it to even find any. And what was there was hard and dry; more like porchetta jerky. The sandwich was mainly large amounts of chopped up broccolini and overly sweet, pickled fennel on some nicely grilled bread. And, if there was any Brun-uusto on it, I never found it. For me, it was a major fail. Gary's picture of the St. Gennaro looks good. If I go back, maybe I'll try it. Can confirm the St. Gennaro has been delicious and ample on both visits. The chicken and dumplings soup was also quite good. So far I've been pretty impressed. Terrific lunch Wednesday at Tempesta with the ever engaging Major Nancy Powers. Much as I enjoyed the food company was even better! I've only been a few times and it seems to me Tempesta gets better, smoother, more delicious with each visit. Mortadella, salsiccia secca piccante, hot coppa, pickled cauliflower, wagyu pastrami. I like what's going on here, particularly the boards and salads. The best sandwich I've had so far is the truffuletta - why didn't someone think of this before - which is like an Avec focaccia with a case of the meat sweats. The thing is packed with mortadella and a composite of relishes with pesto and eggplant and giardiniera notes and a downright dirty size. However, for $15 with tax and beyond with tip I could probably provision a few of these with a D'amato's / Bari double-dip down the street. I took away a much more reasonable package of frozen maple breakfast sausage ($3.99) and fettuccine fatte in casa ($5). Both were exceptional. They have espresso drinks (but the staff has seemed short on time to prepare on multiple visits, and is notably also still learning their own register system) and good gelato. Tempesta was on Channel Nine's Chicago's Best this weekend. Should give them a nice boost. I'm glad I gave this place another try. With the meatless-for-me Southside Johnny now dead to me, there were still other sandwiches to try. We were really pleased with The B. Franklin (Roasted Turkey, Hooks 2-Year Cheddar, Pickled Fresno, Avocado, Pea Shoots, Sofrito Aioli on Sourdough), The St. Gennaro (Hot Italian Sausage, Pickled Pepper Mojo, Roasted Onions, Lolla Rossa and Aioli on a Brioche Bun) and the Potato'Nator (Smoking Goose Bacon , Hash Brown, Fried Egg, American Cheese, Lettuce, Tomato and Pickled Red Onion on a Brioche Bun). 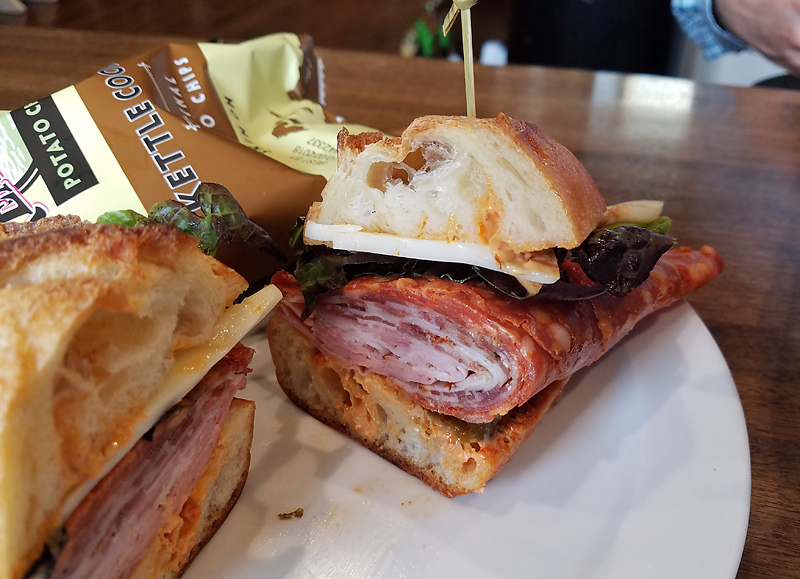 Between these and The Dante I had last time, (Hot Soppressata, Mortadella, Finnochinoa, Hot Coppa, Porchetta, Provolone, Giardiniera, ‘Nduja Aioli, Lettuce, and Tomato on a Baguette) Tempesta's sandwich line-up is notably strong. It's not likely to ever make me forget that Bari is just 2 blocks away but the creative, distinctive builds and high quality of ingredients here are truly a draw and make it a serious sandwich destination. I've had the Dante a couple times and it really scratches the itch every once in awhile. 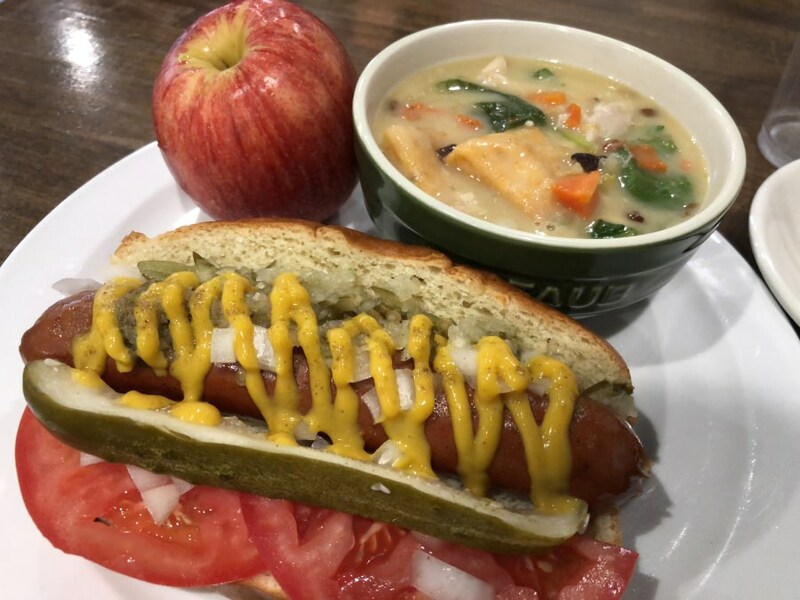 Fancy hot dog on Grand. Interesting DTTG style, but when each veg and condiment is local and peak, and served on a buttered grilled lobster roll bun, it's more than the sum of its parts. The chicken and dumpling and Calabrian chili soup is tremendous with the little dollop of sour cream stirred in and fresh herbs. Really nice stuff over at Tempesta (again). Eat-in lunch earlier today . . . Loved the wagyu pastrami and the overall crispy-gooeyness of the sandwich. 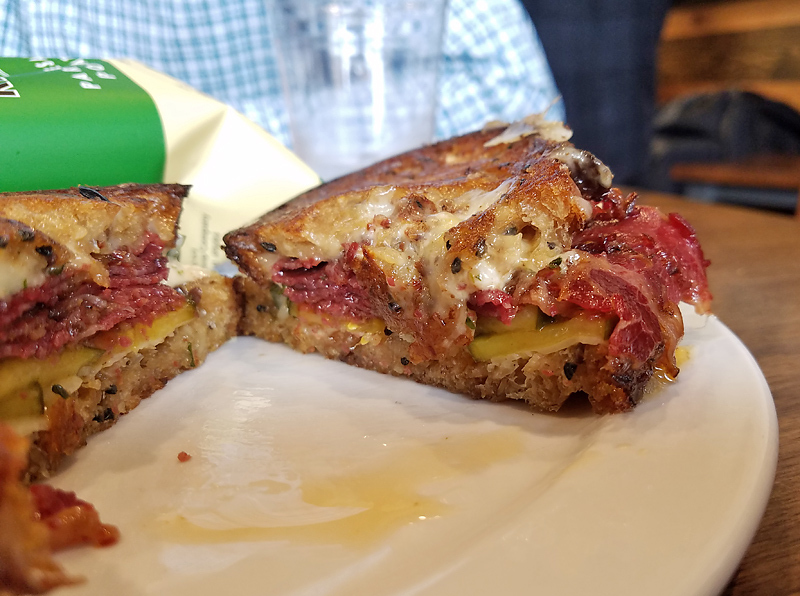 I would have liked a bit more pastrami and a pickle component that was a wee bit less sweet, but still a really fine sandwich. Nice flavor here but a strange, soft texture that didn't wow me. Had to try them, though. Service was friendly, as were the other customers with whom we interacted. This place is a gem. That's the most disgustingly beautiful picture of a sandwich I think I've ever seen, Ronnie. Kudos. I purchased a porchetta roast from Tempesta which I roasted off for Christmas Eve dinner. What a stunning roast! pronounced Italian herbs/fennel, a pork roast on steroids, my entire family was in a food coma.